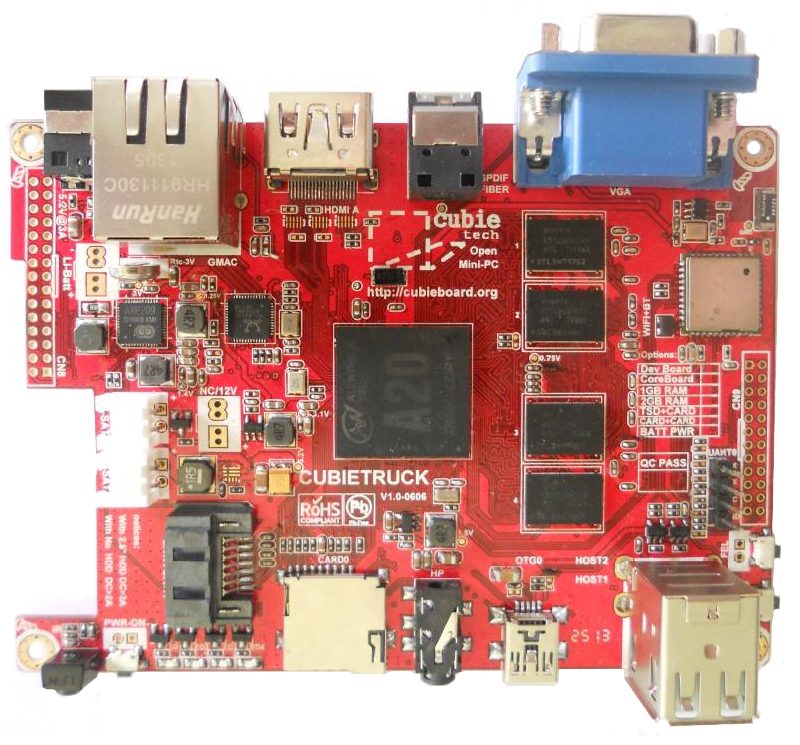 The Cubieboard open SBC project began shipping a faster Cubieboard2 version of its open source Linux and Android SBC, and revealed prototypes of a new, larger, enhanced Cubietruck model. Like the $59 Cubiboard2, the Cubietruck uses an Allwinner A20 dual-core Cortex-A7 SoC instead of the original’s single-core Allwinner A10, and adds a 2GB RAM option, WiFi, Bluetooth, gigabit Ethernet, VGA, and SPDIF ports. Note that the abbreviation “SBC” in the above-linked article stands for “single board computer”. In our opinion, if the Cubietruck works reliably it could relegate the BeagleBoard Black to also-ran status, and could even give the Raspberry Pi a run for its money among those who’d like just a bit more power and a wider selection of outputs. For Home Theater PC builders, the inclusion of a SPDIF Toslink optical port is no small thing. We’ll definitely be keeping an eye on this one!